I have, what I believe to be, trumpet vines invading all over my yard. The leaves are identical but I haven’t seen any flowers or buds start to develop on any of the new vine growth. With the exception, of course, being the original, established plant. Oh! These will flower when it is HOT. They tend to like the heat quite a bit. Also worth mentioning... These are extraordinarily invasive and attract ants. Just be careful with this plant, and know that it will become a problem if it isn't managed properly each year. 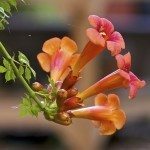 Unfortunately, there are too many plants with the name Trumpet vine to give you any accurate information. If you could include a photo of which one you are referring to, then I could help you to figure out what you have, and when it will flower. Or if you know the scientific name for the plant that you are referring to, then this is always the best nomenclature to go by, as it will point me to the exact plant without question. Campsis radicans Would be the scientific name. I don’t have a photo as it isn’t foliage season here in NH yet!